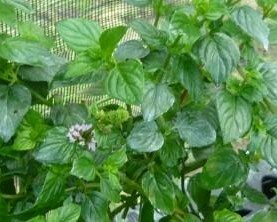 Lime Mint -- Culinary mint variety with large dark green rounded leaves and tall upright growth habit. Citrus-lime scent and flavor. Good tea mint or served with fruit punch, margarita's or other drinks. Easy to grow perennial zones 4-9. Live starter plant in 3 inch container. Not a strong Lime smell and vigorous grower. Have to watch or it will take over. Love the color of the leaves and shape. Grows quite tall in it‘s prime. Smells similar to basil, orange, or lavendar mint. Dark green leaves. Grows great.